With Cadence Jarrell harnessed inside her new pink-and-purple Power Wheels Jeep, her dad Chris gently guided her hand to a red button on the steering wheel. The Jeep jerked forward. Her blue eyes widened. Then, a smile. It looks like a heartwarming Kodak moment but — if you look closer — it's more than that. It's a revolution. That's how Cole Galloway described the GoBabyGo! 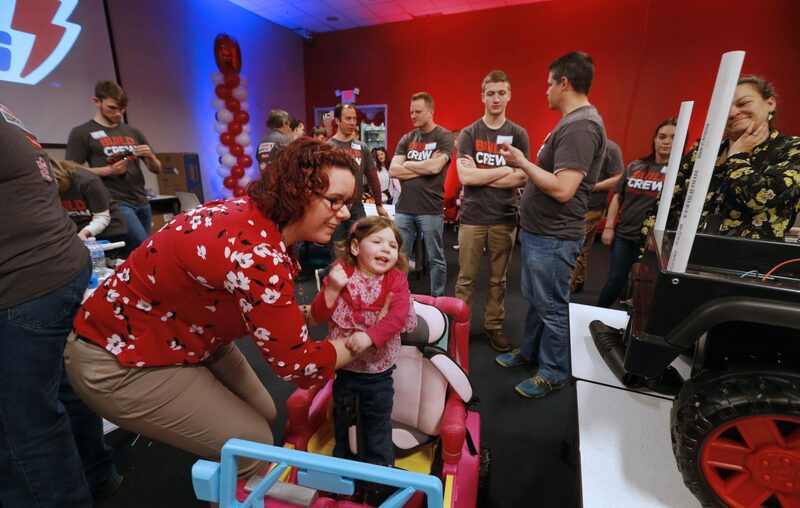 event at Fisher-Price's East Aurora campus Thursday — where teams of Fisher-Price employees worked with students to retrofit Power Wheels vehicles for children who wouldn't be able to move on their own without them. Galloway, a physical therapy and brain sciences professor at the University of Delaware, founded GoBabyGo! in 2007. The group gives away all of the information needed to modify vehicles free online, and chapters around the world have hacked and presented 8,000 retrofitted vehicles to children in need. With pediatric wheelchairs costing up to $7,000 and young children who grow quickly, children ages three and under often don't get to move independently, until they're older. That means they miss an important window for mental and physical growth. The $200 toy modifications are catching on, as a powerful alternative. "It's crowdsourced manufacturing," Galloway said. "It's citizen science." A Buffalo chapter, with the support of Fisher-Price and Oishei Children's Hospital, is in the works, as is a national K-12 STEM curriculum. "You'll have kids learning STEM, but actually building a car and giving it to a child in their neighborhood," Galloway said. "It has an impact on the whole community. It's kids building for kids." James DeLaura, a technology and engineering education professor at Central Connecticut State University, teaches the GoBabyGo! program to his student teachers. 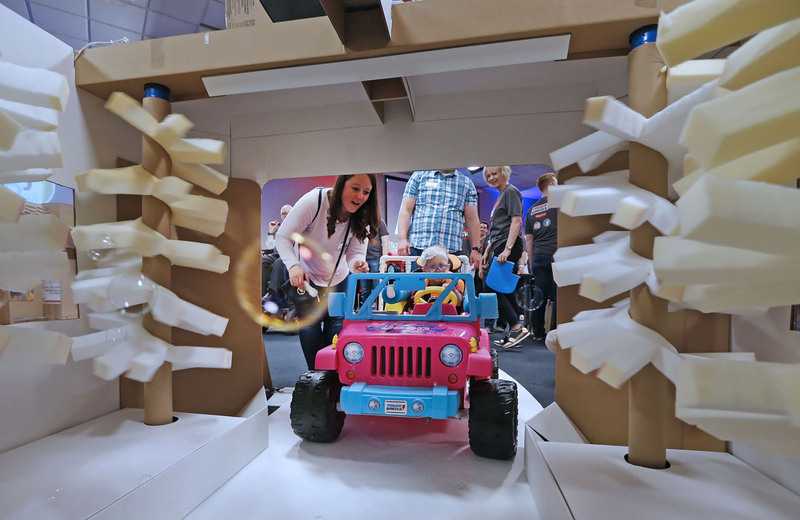 He and his students led the Fisher-Price employees through modification of eight vehicles for eight families Thursday. CCSU students go on to teach the program in their K-12 classrooms when they graduate. Megan Hislop, a CCSU graduate and middle school teacher, has built six cars with her middle school students and worked with the district's physical therapist to place the vehicles with families in need. Research shows that children who are chair-bound can have cognitive, language and physical delays simply because they're stuck in one place. Once they have control of their environment, "their neural network lights up" and they become more expressive, said Gary Collins, senior manager of design for Power Wheels. "Every child grows through play. It's how we model life. When you're immobile, it's harder to copy mom and dad and learn those things," Collins said. "When they realize 'I pushed this button and made it go,' their brains love it so much." Nearly three years old, the only way Cadence Jarrell of West Seneca can move on her own is to roll. Born at 35 weeks, after a fetal stroke, her left side is weak and her right hand is compromised. "She wants to move but she can't," said her dad Chris Jarrell. CCSU student Julia Burch and her team got to work, rewiring and modifying the Jeep to Cadence's precise measurements and needs. They added foam boards to help her sit upright, put removable foam behind her seat so she can reach the pedals — it can be removed as she grows — and covered the hard plastic roll bars with soft pink pool noodles. 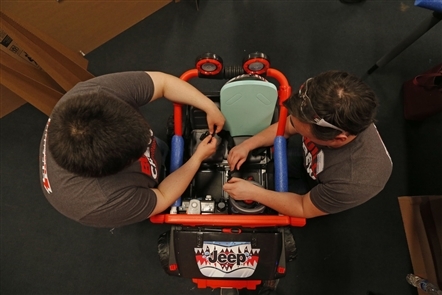 The team rewired the motor so that the vehicle will no longer travel in reverse and will only move at a slow rate of speed. They added a kill switch on the back, where parents can reach it. When Cadence finally got to get in and give it a try, the only smiles bigger than hers were on the faces of her building team and parents. Dad Chris said he was "blown away" by the care and generosity of everyone involved. "We have a nice big, fenced-in yard that we don't really get to use with her," said Cadence's mom, Camie. "Now we will."